Singer Frankie Sandford has joined a host of other celebrities in wearing her heart on her sleeve today as part of a new campaign for mental health anti-stigma programme Time to Change. 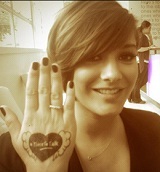 The Saturdays singer (pictured) is wearing a heart-shaped fake tattoo designed by contemporary British artist Stuart Semple, to support the Time to Talk campaign, which is jointly organised by the charities Mind and Rethink Mental Illness. Fellow celebrities including former boxer Ricky Hatton, comedian Russell Kane and This Morning’s Matt Johnson are also joining in the campaign after a recent survey commissioned by Time to Change showed that 45% of 25-35 year-olds say that people in the public eye have made them more aware of the stigma that surrounds mental ill health. After launching the campaign Sandford said: "Mental health is still such an awkward subject, yet if someone was going through another physical illness we wouldn’t hesitate to ask them how they’re doing. When I experienced depression, I had the support of friends and family which really helped - being able to talk about it is really important. "I hope by supporting Time to Change I can raise awareness about the importance of starting a conversation. If you know someone experiencing a mental health problem, you could ask them how they are, or send them a quick text to let them know you’re there – it can make a huge difference and remind them that they’re not alone." The research also shows that more than a third of people (39%) say that hearing about a celebrity talking about their own experiences in the media has made them think more positively about mental health in general. Sue Baker, director of Time to Change, added: "Mental health problems can happen to anyone, famous or not, and we all need the support of those around us when it happens. But hearing from someone in the public eye can help others to feel able to say ‘I’ve gone through that too’.